Phoenix Blinds supply and install plantation shutters in the Illawarra region from Helensburgh through to Nowra including areas such as Campbell Town, Southern Highlands, South Coast and surrounding areas. We are a family owned and operated business established 1997 – our team have been providing high-quality plantation shutters to home owners and businesses for over two decades. For more information regarding our full range of plantation shutters, please get in touch on (02) 4257 5822 or visit our Oak Flats showroom. 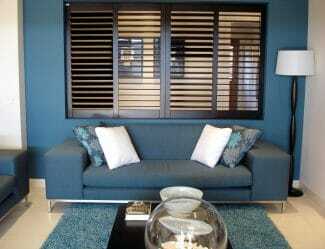 Plantation shutters are both attractive and functional. They are great for air control and adding ventilation to a room – designed for warm climates, they are easy to operate with moveable blades that allow airflow and light into a room. Our range of plantation shutters are sourced from high-quality materials and are available in either timber or PVC. 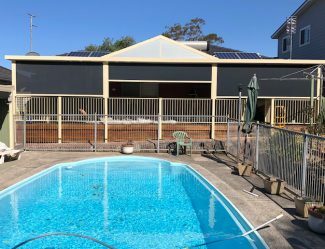 We generally recommend PVC for most of our Illawarra clients because it will last longer in our climate, however timber is the preferred option for larger panels due to its lighter weight. If you are uncertain which option will suit your home, budget and application the best then we invite you to visit our show room or call (02) 4257 5822 to organise an obligation-free consultation with one of our sales representatives. If you are interested in installing plantation shutters in your home or commercial business, then the first step is to request a free quote either as part of an in-home consultation or by uploading your house plans here. You can also bring your plans in-store and speak to one of our experienced staff. If you are happy to move forward with the quote then we place your order (we will need to do a check-measure if your quote was based off plans) and take a 25% deposit. Plantation shutters have a longer turnaround time than most of our other products and depending on which options you select, the time frame from placing your order to installation is 8-10 weeks. We will confirm the installation date with you when we have a confirmed delivery schedule. 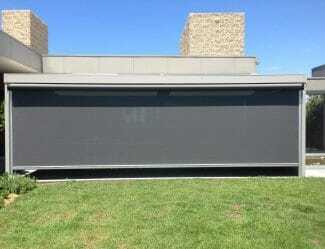 Phoenix Blinds install aluminium roller shutters for homes and commercial buildings in Illawarra. We are a family-operated business based in Oak Flats and we have been providing high-quality products paired with exceptional customer service for over two decades. Our team are experienced and professional, and we offer warranties on all our products and installation services. For more information about Phoenix Blinds or our range of roller shutters, please get in touch on (02) 4257 5822 or visit our showroom. These are hardwired into your electrical system making them slightly more expensive to install. These shutters run on a rechargeable system that does not need to be hardwired into your existing electrical systems. This option is generally our preferred model because it is cheaper to install and if there is a fire or power outage, you will still be able to operate your shutters. Like the rechargeable shutters, our solar powered option does not have to be hardwired to your main electrical system, however as the solar panel sits above the shutter, they can only be placed in areas that receive enough sun. 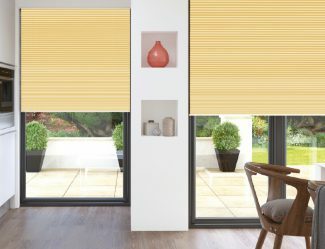 If you are interested in having roller shutters installed on your home or office then the first step is to get in touch with the team at Phoenix Blinds to request a quote – you can arrange for a free in-home consultation, visit us at our showroom or upload your house plans and requirements here. If you are happy with your quote and want to move forward with the order then we will ask for a 25% deposit. Once the deposit is received, we place your order and book in an installation date – the turn-around time for roller shutters and other external products is generally 4 weeks. Our team will take care of the entire installation process and will show you how to operate your new motorised aluminium roller shutters. Get in touch with Phoenix Blinds to discuss our full range of roller shutters and request an obligation-free quote. Call (02) 4257 5822. Phoenix Blinds are professional installers of automatic awnings in the Illawarra region. Established in 1997, we have been providing Wollongong, Shellharbour, Southern Highlands, Campbell Town and surrounding areas with high-quality products and reliable service for over two decades. Visit our gallery or get in touch with us on (02) 4257 5822 to learn more about our automatic awnings or to organise a free measure and quote. Automatic awnings are spring-loaded system that automatically release under pressure – hence the name ‘automatic’! 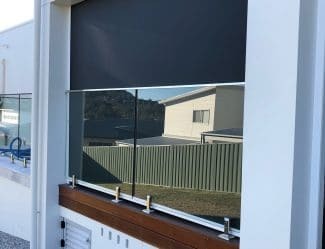 Our Illawarra customers love these because of the peace of mind that they offer – you can leave them down during the day and if crazy winds suddenly pick up as is prone in this region, then the awnings won’t get damaged or get ripped off. Automatic awnings are ideal for keeping the heat and glare off your windows while still allowing some natural light to filter through. They also add privacy and are available in both residential and commercial options. If you are interested in installing automatic awnings on your home or office then the first step is to organise a free measure and quote with one of our sales representatives. During the consultation, our sales rep will show you all your different options including styles and colours. You’ll then be given a quote and if you choose to go ahead then we will request a 25% deposit. Once your order has been placed it will take approximately 4 weeks for your new automatic awnings to be delivered. We will then book in a suitable installation date and time. If you’d like to view our full product range you can visit our showroom or check out our gallery. We can also provide quotes based on your building plans, however we will need to do a final check measure before we finalise your order – you can submit an online quote request here. Get in touch with Phoenix Blinds to discuss our full range of automatic awnings and organise a free measure and quote. Call (02) 4257 5822. Phoenix Blinds have been supplying and installing folding arm awnings in Illawarra and surrounding areas since 1997. We are a family owned and operated business that values quality products, exceptional customer service and fair pricing. Visit our gallery or showroom to view our range of folding arm awnings or get in touch on (02) 4257 5822 to organise a free measure and quote. Folding arm awnings are the traditional style of fabric window awning. They are ideal for reducing heat and glare from the sun while still allowing some natural light and airflow to filter through. This style of awning is available for both commercial and domestic applications and has the added options of being motorised or integrating with a Smart Home system such as Google Home or Amazon Alexa. The biggest advantage that automatic awnings have over folding arm awnings is their spring-loaded system that automatically releases the awning as it has pressure applied to it. This is an important factor to consider in Illawarra, Wollongong and surrounding areas, where strong winds can whip up out of nowhere. Folding arm awnings have a sensor system available as an optional extra which can combat this issue – the sensor will detect harsh winds and will automatically retract the awnings on your behalf. If you are interested in receiving an obligation-free quote for folding-arm awning installation then the first step is to book in a constulation with one of our sales representatives. We can provide you with a quote based on plans or your own measurements, but we will need to do a check-measure before we can place your final order. Use our online form to get a quick online quote. Once we have placed your order it will take approximately 4 weeks for your new awnings to be manufactured and delivered. We will then contact you to organise a suitable installation date and time for your awnings. All our folding arm awnings come with a two-year warranty on the installation componentry and five-year warranty on the fabrics. Get in touch with Phoenix Blinds to organise a free measure and quote for any of our folding arm awning products. Call (02) 4257 5822. 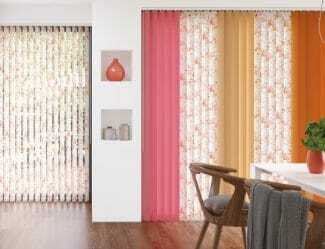 All the components and fabric for our vertical blinds are sourced from well-known Australian brands and companies. We provide a 2-year warranty on the installation and components, and 5-years for the fabric. An affordable option that is great for doing all the doors and windows in a house on a budget. The ability to rotate the blinds allows you total control over the level of light and heat that you want to allow into your home. Great for big doors and windows – they are available up to 5m high, whereas roller blinds are only available up to 3m, so if you have a particularly high door or window, vertical blinds are your best option. Visit our Oak Flats showroom to see a functioning vertical blind display and speak to a sales representative about the different fabric and style options. 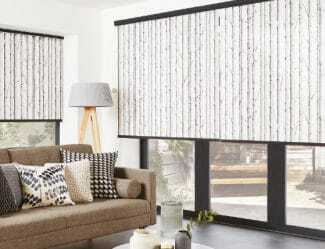 If you are interested in having vertical blinds installed in your Illawarra home or office then the first step is to get in touch and book in an obligation-free measure and quote service. We’ll send a sales representative to your home to discuss the different options with you, show you fabric samples and help you select the products you want installed. They will then provide you with a same-day quote and if you choose to move forward with the quote then we will take a 25% deposit before placing your order. Once your order has been placed we will arrange a suitable installation date and time – the timeframe from placing your order to having your new vertical blinds installed is usually 3 weeks. Phoenix Blinds have been installing venetian blinds in Illawarra homes and offices for over two decades. Established in 1997, we are a family owned-and-operated business with a focus on providing high-quality products paired with exceptional customer service. All our internal blinds – including Venetians – are manufactured using Australian-sourced components and fabrics, and come with a 2-year warranty. Our range of Venetian blinds are available in timber, PVC and aluminium, making them suitable for a wide range of applications. 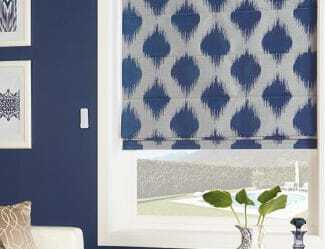 The rotating blades make them great for controlling the level of privacy, light and heat that you want to allow in, and they are a very attractive alternative to fabric blinds. Visit our Oak Flats showroom or browse our online gallery to see some examples of the different options. 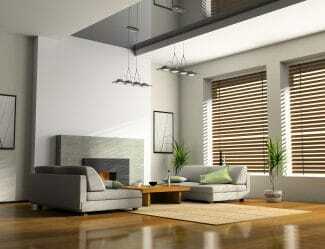 Stained timber Venetian blinds are a beautiful and modern addition to any home. They do require some maintenance in terms of dusting, but it is well worth it for their aesthetic. PVC Venetians are ideal for wet areas of the house such as kitchens, bathrooms and laundries as they aren’t prone to warping from moisture like timber does. The main benefit of aluminium Venetians is their weight; they are extremely light. While timber and PVC Venetians are available up to 2.4m, aluminium can go up to 3.6m – this makes them ideal for larger windows in offices and commercial buildings. Aluminium also has the added benefit of being the cheapest option of the three. If you are interested in installing Venetian blinds in your Illawarra home or office then get in touch to organise a free in-home measure and quote. Our sales representative will walk you through the different options and help you select the best style based on your budget and application, providing you with an on-the-spot quote. If you choose to move forward with the quote then we will collect a 25% deposit from you and then place your order in our system. Most internal blinds have an average turn-around time of 3 weeks from order to delivery – once we have your blinds we will organise a suitable installation date. Get in touch with Phoenix Blinds to organise a free in-home consultation and receive a quote for Venetian blinds. Call (02) 4257 5822.